Opened in 1935 with one 11-kilometre (6.8 mi) line and 13 stations. 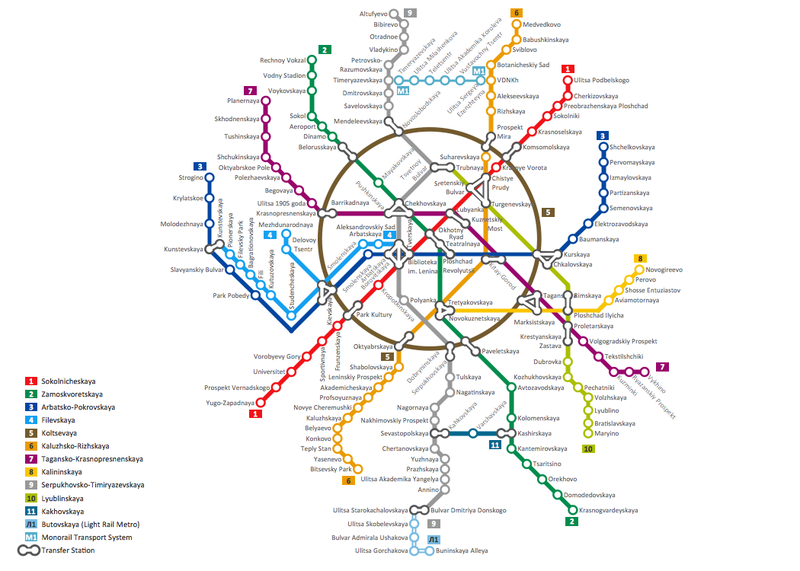 As of 2012, the Moscow Metro has 186 stations and its route length is 308.7 kilometres (191.8 mi). The system is mostly underground, with the deepest section 84 metres (276 ft). All source documents are vector graphic documents. They are available for reviewing, modifying or converting to a variety of formats (PDF file, Power point Presentation, image or MS Visio) from ConceptDraw STORE, for all users who have installed Metro Map solutions. Tool to draw Metro Map styled inforgraphics. New York City Subway map sample.